The Scottish tidal energy developer installed the first Nova M100 turbine in the Bluemull Sound, Shetland in March 2016. The device has been generating up to full power and across all tidal conditions. The second in a series of three 100 kW turbines was deployed alongside the first turbine in August 2016, making this the first offshore tidal array in the world to deliver electricity to the grid. In February 2017 the third turbine was installed and grid connected. Bluemull Sound, Shetland in water greater than 30m deep. After successful operation of the three turbines Nova, in May 2017, secured around £190,000 in capital support to build and operate an energy storage solution for the Shetland Tidal Array. 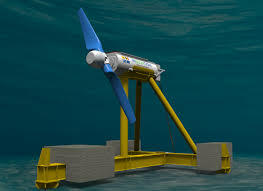 The company also secured its place in the €20.2 million project Enabling Future Arrays in Tidal (EnFAIT). The project which began in uly 2017 and will run until June 2022 was won as a competitive contract awarded by the European Union’s Horizon 2020 research and innovation programme to develop marine energy sources and demonstrate technologies in European waters. The project is a flagship initiative for the EU and marine energy, and aims to increase the commercial viability of tidal power. The only condition of the project was that the Licensee must ensure that the works are carried out in accordance with the agreed EMMP. If through monitoring, as directed by the EMMP, it is determined that the devices could have an adverse effect on site integrity then further mitigation measures may be required at the discretion of the licensing authority. Nova Innovation - Shetland Tiday Array (Bluemull Sound) is located in United Kingdom. Due to the small scale of the project an Environmental Impact Assessment (EIA) was not required to be carried out, however due to the project’s proximity to a Special area of Conservation and 4 Special Protection Areas an Appropriate Assessment was carried out to determine the potential for Likely Significant Effects of the project. Use of computer models to determine the potential for sensitive species to collide with turbine blades. A 98% avoidance rate was assumed. The following calculations are based on the assumption that the devices are operating for 73% of the time as estimated by Nova. All year predicted encounter rate – 3.3. Breeding season parameters based on seals-at-sea density figure – 3.33.